On one level, the Sun God Huitzilopochtli symbolized the creative, regenerative power of the world of the spirit. Sacrifices to him were necessary to provide the nourishment that might ensure the daily rebirth of the sun, whose creating life for man must be reciprocated by man’s providing life for it. As the “People of the Sun,” the Aztecs believed that they had a divinely imposed responsibility to perform that alchemy. They needed to feed him in the form of human hearts and blood. If they did not constantly sacrifice lives – thousands of them, according to the Spaniards – he would desert them. Perhaps it had not always been this way. There is evidence (from the Mayan world, at least) that in earlier times the nobility had performed gruesome “auto-sacrificial” acts, piercing their most sensitive body parts with thorns, with the same ritual intentions: ensuring the movement of the great cosmic wheels of life. Over time, however, the development of a massive, national – even fascist – state had forced an inevitable shift in the idea of sacrifice from the symbolic to the literal, from a primarily internal act to a mass phenomenon in which the political implications vastly outweighed its original world-sustaining intention. Whereas the community had originally existed as an integral part of a profoundly religious cosmos, now religion was constructed to serve the aims of the state (just as, we could argue, Catholicism and its Inquisition was serving the Spanish empire). On this level Huitzilopochtli symbolized the military might of the Aztec state (just as the Spaniard’s Santiago Matamoros – “Killer of the Moors” – served them). Warfare provided captives for the divinely required sacrifices, and it also extended the dominions under Aztec sway. 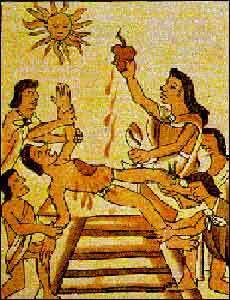 Human sacrifice had taken on its all-important role in Aztec society precisely because it met both mythic and political needs. 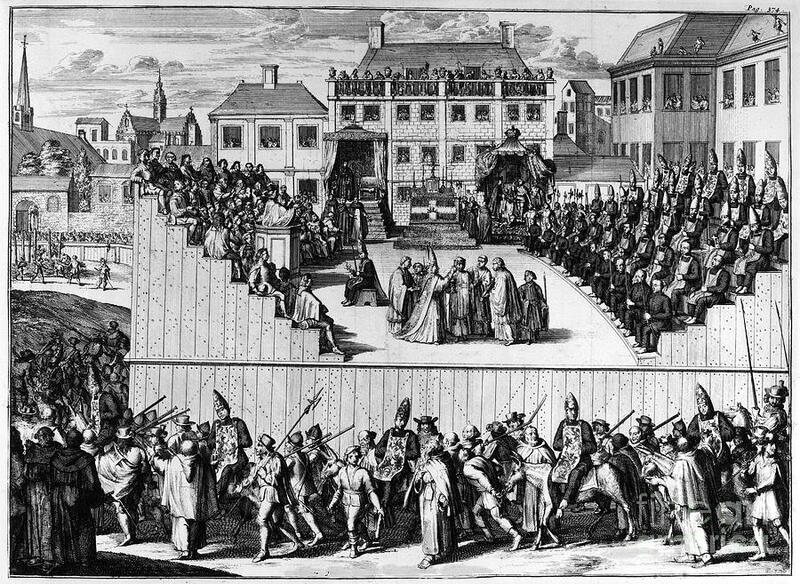 Now it was a sixteenth-century equivalent of the Nuremberg rallies of the 1930s, or the autos-de-fe then occurring in Madrid’s central plaza. In 1519 Cortés and his men gaped in astonishment at the sight of Tenochtitlan, the fabulous capital of the Aztecs, a city that was five times as large as London, perhaps the largest and wealthiest city in the world at the time. 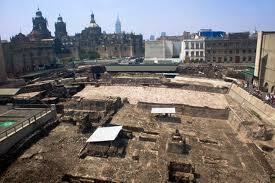 Cortés admitted that the Emperor Moctezuma “…had a palace in the town of such a kind, and so marvelous, that it seems to me almost impossible to describe its beauty and magnificence…there is nothing like it in Spain.” His men, stunned at the sight of the splendid city, wondered if they were dreaming. The only thing that could have equaled the awe they felt in viewing these marvels was the horror they experienced watching the mass sacrifices, with hearts torn out and bloody, headless bodies being hurled down the steps of the Templo Mayor. Something needed to be done. Thus sacrifice took on a dual meaning for a second time. Purely humanitarian values dictated that the appalling spectacle must end. But the Spaniards (who were hardly innocent – they would shortly import the fearful Inquisition to Mexico) had their own reasons. They aspired to both confirm the military conquest of Mexico (attained only with the aid of large numbers of Indians whom the Aztecs had brutalized) and replace the indigenous, pagan beliefs with the one true religion. So it was necessary to eradicate both the old rituals and the buildings where they occurred. 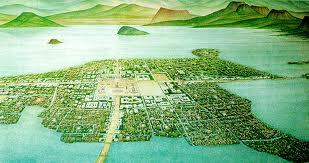 The magnificence of Tenochtitlan did not deter the Spaniards from their dual goals of conquest and conversion. After the final victory (which occurred two years later on August 13th), they destroyed the city and used the stones of its great buildings to build their new capital. They built their new cathedral atop the ruins of the Templo Mayor, (which wouldn’t be rediscovered until 1978) and buried many of the idols. But some of these ancient sacred places retained their sense of mystery. Understanding this, the Spaniards chose the hill of Tonantzin-Coatlicue, which used to house a formidable statue of the Goddess, to establish both the new myth and the image of the Lady of Guadalupe. Only with such transposition of deities could the Spanish conquerors manage to banish the Aztec cult of the terrible mother. Then followed two and a half centuries of the history of a new, Mexican nation: the blending of two races; massive exploitation of natural resources and urban development; cultural genocide and slavery; and the flowering of a profoundly syncretistic Catholic faith. This faith was tested on August 13, 1790 – the anniversary of the collapse of Tenochtitlan – when workers unearthed a colossal statue near the site of the old Templo Mayor. Coatlicue, with her skirt of serpents and necklace of skulls, saw the light of day for the first time in 269 years. The Indians…came with a lively curiosity to contemplate their famous statue…(but) there was some secret religious motive. It was thus essential to prohibit their access absolutely; but their fanatical enthusiasm and their incredible cunning made a mockery of this decision…they would leave their towers and hurry to adore their Goddess…some on their knees, other prostrate… before the statue, and holding in their hands burning candles and other diverse offerings of the sort their elders used to present to their idols. And (this)…led to the resolution, as we said, of once more placing the aforesaid statue beneath the ground. 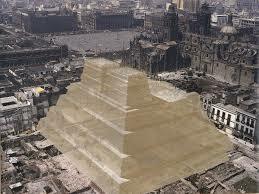 It was dug up in 1803 at the request of the archaeologist Alexander Humboldt, also a church bishop. He made a cast, which was displayed the next year in London, but the sculpture was soon reburied. Apparently, the authorities still considered it too repulsive – or too threatening – for public display. In 1823, after Mexican independence from Spain, Coatlicue was dug up yet again. This time, the viceregal authorities, reflecting new attitudes about the Mexican past and a new sense of the Mexican nation, decided to preserve her. But they kept her hidden in a corner of the university, then behind a screen. Later she was placed in a visible location, as an object of scientific and historic study. Many years later, in 1879, she came to the garden of the new National Museum of Anthropology. The space, however, was not open to the public, since it was assumed at the time that only educated men would have the intellect and rationale to handle such a horrific image. Coatlicue only attained her stature as a world-class work of art when the new museum building opened in 1964. In Part Three of this essay, we will attempt to understand why even today she has lost none of her astonishing magnetism. bets at fifa, and real madrid, or similar, and f.e. finnish ice hockey offices? human trade — associated trade on people doing humanistic sciences and fine arts…what is that, and who is putting these people in the games at first place? what is the purpose? to tease these people quiet? or just slow them down? or scare them to whealchairs?